Well, here we are – my first day at the Hatfield House Christmas Frost Fair. I’ve not done this event before, so I have no idea what to expect. Markets are very strange things. Some may be busy but just be the wrong market for me and I struggle to cover my costs. Others may be quiet with other traders complaining, and I do really well. You never can tell in advance and even the same fair may be totally different from one year to another. 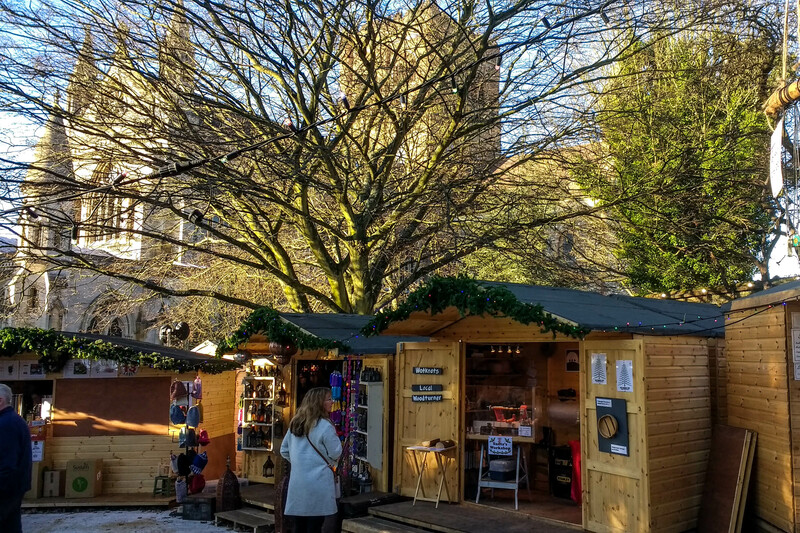 I could have a quiet 4 days building up a bit more stock for St.Albans, or I may be run off my feet and go to St.Albans empty-handed. Either way, I have my glamorous assistant with me today so that I can keep turning. It’ll be a different glamorous assistant tomorrow, a third on Saturday and yet another on Sunday. Aren’t I blessed! 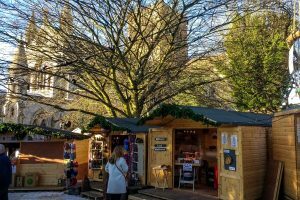 The Christmas Fair at Knebworth House is now well under way, and with about 200 stalls there’s something for everybody including crafts, clothing, food and Christmas decorations. Had a young boy at the stall today who was really taken by the wood and seemed to love its natural feel and touch. He loved the pens and kept coming back throughout the afternoon, but obviously couldn’t afford one out of his pocket-money. I had one that was slightly sub-standard and made his day by giving it to him. It’s just wonderful to see youngsters engaging with something that isn’t electronic and he (and his mum) also seemed keen on the idea of one-to-one tuition, so hopefully I’ll see him again after Christmas. If you want to come along, tomorrow is the last day! Sometimes mistakes can be expensive, waste a lot of time or be a real frustration. At other times they can be fortuitous, as is the case here. 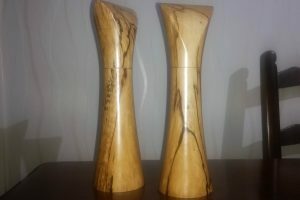 I had intended that this pair of spalted Hornbeam salt and pepper mills would be finished with swept tops (my most popular style), but I was tired and made a cut in the wrong place. Aargh! But what to do? Do I consign both to the flames, or do I have a single mill and consign just one to the fire? 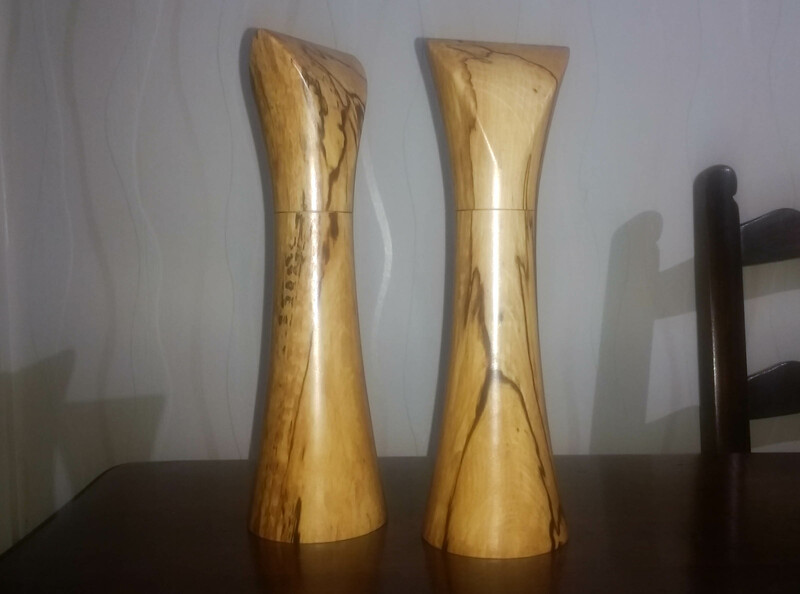 I decided the timber was too good to waste, so decided to try a new shape and this is the result – a pair of bishops, so-called because of the resemblance of the top to a bishop’s mitre. Just one pair at the moment, so not enough for a bench or psalter, but I’m working on it. And I suppose the moral of this tale is that whatever the mistake, we can always learn from it! PS. If you are interested in this particular pair, then they’ll be ion sale at Knebworth House this weekend. Hooray!! My old faithful is back up and running. 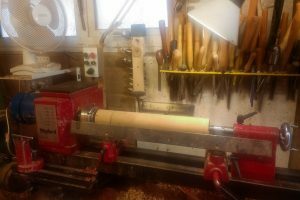 The small demo lathe that I was using was great for fairs, but is does have its limitations. Many thanks to S G Webb & Sons for a grand job, and for actually completing the repair earlier than promised. 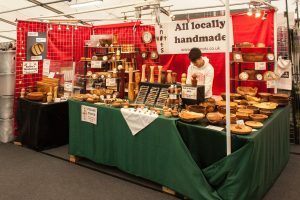 I must confess that i was in a bit of a panic with Christmas fairs looming and a stack of half-finished pepper mills that were as good as useless. 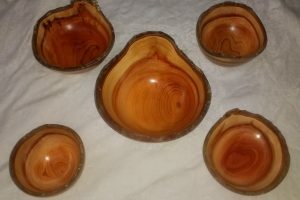 Now I just need to finish them – that’s the first on the lathe with all the drilling done and ready to shape. 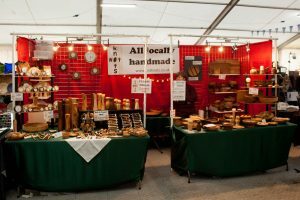 They won’t be ready for my first Christmas fair at Knebworth House, which is now only 2 days away, but there’s a reasonable chance that I’ll have them done for the following weekend at Hatfield House. Still no decision yet about St. Albans, but watch this space. 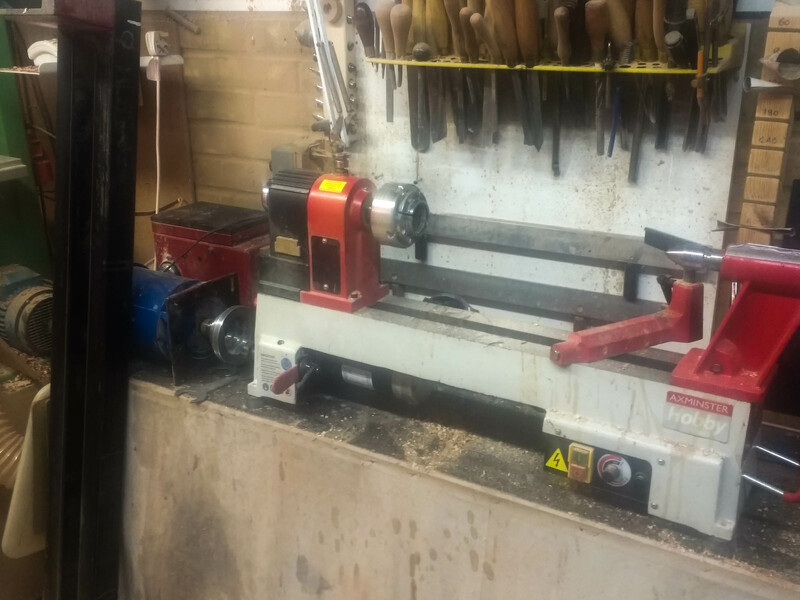 My good and faithful old lathe, which must have been at least 20 years old when I bought it 20 years ago, finally gave up the ghost today. For those that know anything about lathes, part of the drive on the tail-stock had worn so much that the keep (that’s supposed to ‘keep’ it in place) would no longer hold it and the tail-stock wheel simply unscrewed from the tail-stock spindle. Not very helpful!. 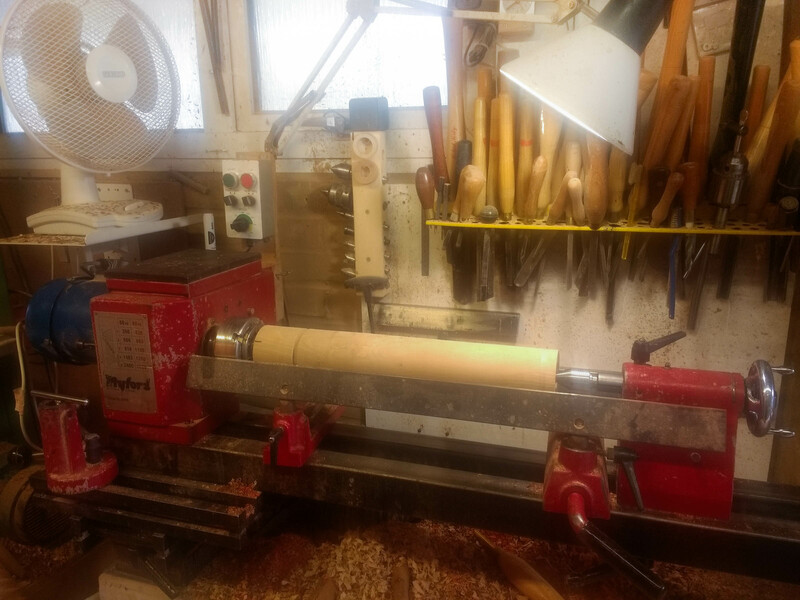 I was int he middle of a run of large pepper mills (the drilling of these does put a lot of strain o the tail-stock drive) when it went, so I now have a stack of half-drilled mills one week before my first Christmas fair. 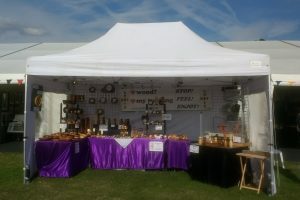 Thankfully, I have the small lathe that I take to fairs, so I can still produce some small items, although I’ve had to strip down the old lathe to make room for it. 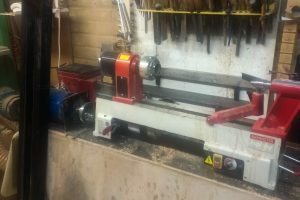 However, I have no chance of doing any more mills until the old faithful is repaired or I get a new lathe. 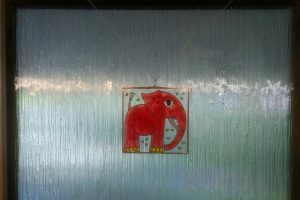 I have found a man with a small engineering workshop who is going to try to effect a repair, but not sure how durable it will be. But won’t get that back for nearly a week! I’ve not made weather stations before, but these particular pieces of wood seemed to lend themselves to them. 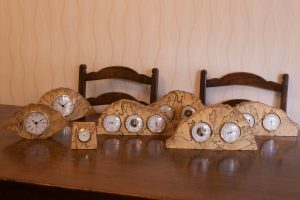 They were all going to be clocks, like the ones on the left, but the proportions of the wood seemed wrong for a single clock face. There’s no point in having two clocks in the same piece – unless you’re always wanting to know the time where Auntie is in Australia, or some such – so I thought I’d add a few weather instruments. 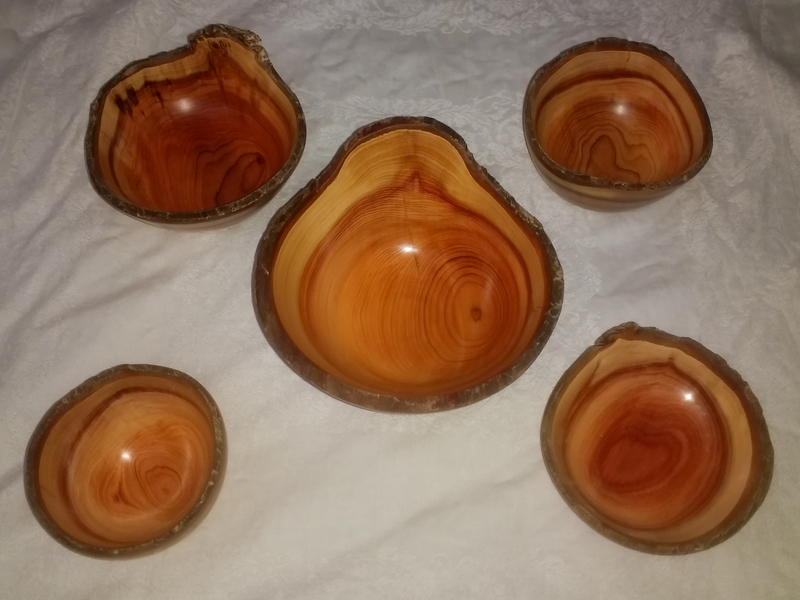 they seem to work well, and ready in time for my first Christmas market at Knebworth House – just 3 weeks away. These have yet to be added to my gallery – that will have to wait until I find time to photograph them properly. But for now, the leaves on the lawn are calling! I was teaching one of my regular pupils yesterday, a delightful young man aged 12. This was his first lesson since his return from holiday and he presented me with this glass hanging. It was apparently his own idea to get it for me and I was really touched by his thoughtfulness. It is always a privilege to pass on my skills, but it is generally to more ‘mature’ people – often looking to take up turning in retirement. It is a double privilege to be able to pass on my skills to a youngster, particularly one who seems so captivated by the whole process. The glass is now hanging in the window above my lathe to remind me how blessed I have been to be able to teach him. All set for my last day at RHS Gardens, Hyde Hall. Weather has been fantastic every day and today is also set to be a scorcher. We’re not used to Bank Holidays like this. It’s normally a case of bank Holiday = umbrella, but this weekend it’s been more a case of parasols and sun screen. 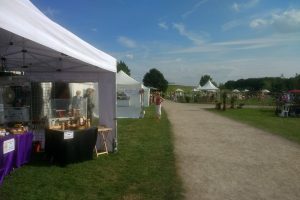 So if you fancy a great day out at a great craft event… The gardens are good, too!